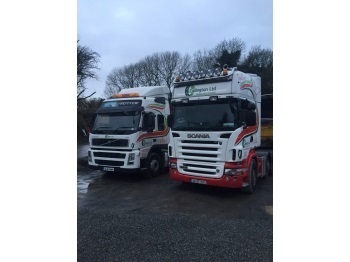 Leaders in road recycling in Ireland for more than 10 years. 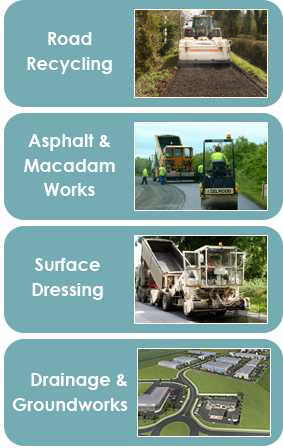 Based in the Tullamore, Co. Offaly, Ireland Callington Ltd has over 40 years proven experience in the Road-Recycling/Stabilisation, Asphalt and Macadam works and Surface Dressing/traditional tar spraying industries. Savings of up to 40% compared to conventional bituminous overlays. No increase in finished road levels and consequently no concerns regarding kerb height or drainage at entrances; in fact if either of the foregoing are presently an issue, the road level can be reduced. Reduces issues associated with high soft edges along the road side resulting from conventional overlays. Ideal for roads where trenchwork has been carried out; rather than reinstating just the trench area, the full width of the road can be restored at a reasonable cost. Environmentally friendly, sustainable and conserves natural resources (aggregates) and reduces CO2 emissions. Quicker turnaround in project completion, up to 5000m2 can be completed in one day. Saves on future maintenance costs by constructing a strong, low-maintenance road.